Open CM9.04 is a robot from Robotis controller that is open source, both in hardware and software. In the hardware controller is powered by the ARM Cortex-M3 microcontroller. The controller is also equipped with a model of the head pin compatible with sensors and servo from Robotis. In terms of this controller software using the Open CM software to download the program. 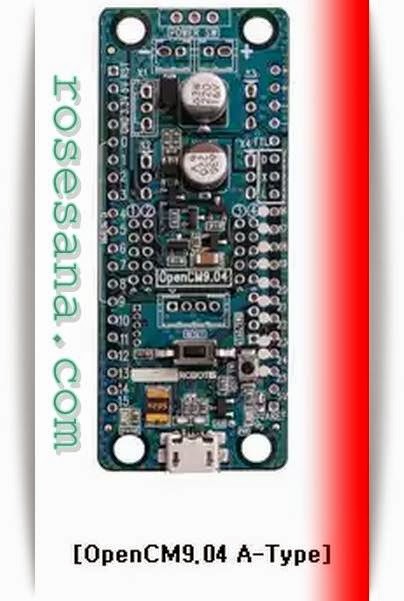 Open CM has a look similar to the Arduino IDE, it will certainly spoil the Arduino lovers. In addition, the software Open CM also equipped library to access the servo from Robotis Dynamixel and sensor. In Version CM9.04-A user should install the header connector to the module itself can be used. Another option is to use a version CM9.04-B which is mounted connectors and headers. - Number of I / O ports: 4 TTL Port (3pin), 4 External Sensors (5pin). 2 types are available: Type A & Type B. The difference between Type A & Type B is the availability of the connectors.